Hebie, M.; Jungjohann, S.; Praygod, G. & Filteau, S.
Despite the increased access to antiretroviral therapy, undernutrition is associated with an increased risk of early mortality among HIV-infected adults living in resource-limited settings. Lipid-based Nutrient Supplements (LNS) can provide nutritional support and can be adapted to the needs of adults infected with HIV. However, consumption of these products may be limited by monotony or by an unacceptably strong taste of highly concentrated micronutrients. This study investigated the acceptability of several new flavours of LNS for HIV-infected adults on antiretroviral therapy (ART). Forty HIV-infected adults on ART completed acceptability tests with one of four sets of LNS products: LNS-30 g sweet, LNS-30 g non-sweet, LNS-250 g sweet and LNS-250 g non-sweet. Each set was composed of three flavours and was tasted with and without food during a single session of sensory evaluation. The supplements were block-randomised and the patients were blinded to the type of product. LNS acceptability was assessed based on descriptive, hedonic and food-action rating tests using 5-point rating scales as well as preference tests. All the flavours got a median rate of 3-Just about right for the intensity of sugar, salt, oil, thickness and 4-Good for the taste. Regarding the overall liking, the supplements were positively evaluated with median of 4-I like a little or 5-I like a lot. The LNS-30 g non-sweet formulation was significantly less appreciated when tasted without food compared to all the other sets of LNS (P = 0.0005). Mixing LNS with local food had no effect on the acceptability. In terms of consumption pattern, all the products got a median rate of 1-Will eat it at all opportunity or 2-Will eat it very often. Finally, in terms of preference there was no significant difference between the flavours. In LNS- 30 g the overall liking was positively correlated with the taste and the intensity of sugar but the prospective consumption factor was negatively correlated with thickness. In LNS-250 g, only the intensity of salty taste was correlated with the overall liking. As the flavours were well accepted, all of them can be used, providing choice and variety to HIV-infected adults consuming them for prolonged periods. There is no need to modify the products’ formulation. 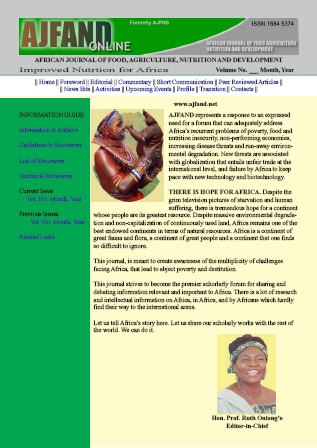 Further research on the acceptability of these supplements over the longer term and in settings where food insecurity and dietary patterns are different is warranted.